Since then there has been some blogging about this as others have made suggestions, but unfortunately it has not been possible for any of us to confirm the source either way. I feel it originated from Maria Hari but am not in a position to check this. eg. ‘The work of the conductor is simply to motivate the child to do well’. p71. ‘The child learns that he can change position. The conductor must prove it to him. The conductor gives him the chance to interact with the environment and to overcome difficulties’ p72. every child must know that he is absolutely free to do what he wants and that he is the most essential, his skills are appreciated, his life has meaning’ p109. Not quite as snappy as the quote asked about, but just as good, I think.This made me realise what a goldmine the book is, it can help with explaining the philosophy and pedagogy behind Conductive Education. It does this clearly and succinctly, and all those wishing to know more should get hold of a copy. At one point Andrew talked about compiling a little book of quotes from the writings of Hari which, perhaps could be looked at with Peto’s proverbs, ( as mentioned on Susie’s blog) if the source can ever be confirmed. Perhaps a collection of such fully referenced quotes would be useful, though of course, it must always be remembered that statements can be distorted when used out of context. Maguire, G. and Sutton, A. ed. (2004) Maria Hari on conductive pedagogy. Birmingham: Foundation for Conductive Education. This is an English translation by Neville Horton Smith and Joy Stevens of the original Hungarian book published in 1971 as Konduktív Pedagógia. It is the most frequently cited title and considered the standard text by many, although it disappointed a lot of people on publication because it was mainly medical in content. Conductive Education was planned as the first in a series covering the background and basis for the practice of Conductive Education, but as far as I know no further parts were published. About two thirds concentrates on medical aspects – the brain, neurology etc before getting down to explaining how Conductive Education can help. These chapters cover such aspects as the group, facilitation, observation and task series. A large number of photographs are included in an appendix , pages 233-375, showing certain tasks used in the groups for the different types of cerebral palsy. This book is now out of print but is held in the National Library of Conductive Education and also a number of second-hand copies are available from Amazon or Abebooks at a range of prices. As I have mentioned before, there are not many books on Conductive Education and even fewer that present a clear account of what Conductive Education actually is, how it is practised. 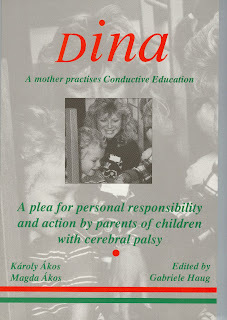 This book was published in 2004 to make a number of papers written and presented by Maria Hari over a period of thirty years and held in the National Library of Conductive Education, available to a wider audience. An edited collection of previously unpublished papers presented in English, French and Russian, 1968-2000, on how to teach children of kindergarten and school-age the conductive way. An unprecendented account in the English language of the philosophy and practice of conductive pedagogy by the originator and developer of conductor-training. In reading these eight papers, arranged in date order, it is possible to see how her attitude to sharing the knowledge willingly, changed over the years as Conductive Education was taken up by others, and ‘practised’ without full understanding of the system. I make no apologies for recommending a book I was involved in producing, as it is an important account of Hari’s ideas, thoughts and attempts to share the system combined with recording part of Conductive Education’s history. and the National Institute of Conductive Education, Birmingham, UK. I hope there will be more in the future which tell us what conductors actually do! If you are aware of any in the pipeline, please do let me know. A list of centres has already been posted on this blog for those wishing to follow up on it. Sutton, A. (2009) Learning for living. Able, March/April, pp.54-57. More about konduktiv pedagógia and konduktiv nevelés…. I was pleased to see Tunde, Andrew and Susie respond to the posting re konductiv neveles and konduktiv pedagogia. I see it as my job to present information about the holdings of the library and leave others with a much more in depth knowledge of Conductive Education to analyse, criticise and comment. This is what they have done, raising further requests for information in the process, so here goes. Otto Klein, from the Humboldt University, Berlin visited the Institute in 1962 calling it ‘Institut für Bewegungspädagogik Budapest’and produced a detailed report of the work there. He referred to the work as ‘Konduktion’ und ‘konduktive Bewegungspädagogik’ and the staff as ‘konduktor’ and ‘Bewegungspädagoginnen’ An English translation of the report mostly used the term ‘movement teacher’ and after a quick scan of the German I could only spot mention of ‘kondutive’ twice amongst the many references to movement pedagogy. Mention of rhythmical intention is made.In 1964 Helmut Eckhardt, a doctor visited whilst on a two week study trip to Budapest and had read Klein’s report two years previously. I do not have an English translation of this and my German is very rusty, but he did use ‘konduktorin’ and ‘konduktor’. Ungvari and Schmidt, two Krankengymnastinen (physiotherapists) reported on a three day visit to Budapest in 1967. Again I have no English translation of this, but they wrote of Pető’s method, rhythmic intention and konduktorinnen. None of these four uses the term Konduktive Förderung,(conductive upbringing) a term commonly used in Germany today. All four appear to be positive enthusiastic reports. As to Pető’s use of education to describe his work, the article mentioned by Andrew is one he published in 1955 in Gyógypedagógia. An edited version in English was published in The Conductor, 1993. Full references for both of these are below. Tunde raised the English translation of Konduktiv pedagogia (published in 1971 by Hári and Ákos) in 1988 which was called Conductive Education, but the use of Conductive Education was quite established by then and further investigation would find if any other terms were used then too . If anyone has anything further to add to this discussion or knows of relevant material please do get in touch. As I said before there is so much in the library that could form the basis of a number of research projects. Photocopies of all the items listed below can be supplied under the usual conditions. Please contact me if you would like any. Eckhardt, H. (1964) Die Behandlung zerebralgelähmter Kinder in der ‘Bewegungsversehrten-Erziehungsanstalt und Konduktor-Seminar’ in Budapest unter Leitung von Prof. Dr. med.A. Pető. Beiträge zur Orthopadie und Traumatologie, 11(6), pp.419-424. Hári, M. and Ákos, K. (1971) Konduktiv pedagogia. Budapest: Tankonyvkiado. Hári, M. and Ákos, K. (1988) Conductive Education. London: Routledge. Klein, O. (1962) Zur Bewegungspädagogischen Behandlung zerebral gelähmter Kinder im Institute für Bewegungspädagogik Budapest. Beiträge zur Orthopadie und Traumatologie, 9, pp.315-332. Pető, A. (1955) Konduktiv mozgasterapia mint gyogypedagogia. Gyópedagógia, no.1, pp.15-21. Ungvari, E. and Schmidt, H. (1967) Bericht über das Institut für Bewegungstherapie in Budapest. Krankengymnastik, no.9, pp.323-325. When did konduktiv pedagógia and konduktiv nevelés become Conductive Education? After posting the piece about Ester Cotton’s visit to Budapest in 1965, I have received an enquiry about the start of the use of the term Conductive Education. Translating the Hungarian phrases ‘konduktiv pedagógia’ and ‘konduktiv nevelés’, (the terminology of choice for most Hungarians) literally gives us ‘conductive pedagogy’ and ‘conductive upbringing’, not Conductive Education.I have had a look at the materials written in English between 1965 and 1972, after which the term started to become widely used in English articles, dissertations and reports. It is not clear, however, from these exactly when and why the system became known as ‘Conductive Education’. Several reports of visits to the Institute made in 1966 give no name to the system, (Bobath, K.; Bobath, B.) but do mention ‘conductors’, (Parnwell; Seglow), ‘the Budapest method’ and ‘Pető’s training method’ (Parnwell). Seglow did report that ‘Pető regards his education as a conditioning process’. In 1967, Ester Cotton published an article in Nursery World which used the term ‘Conductive Education’ and another article with Margaret Parnwell in Special Education which mentioned the ‘State Institute for Conductive Education of the Motor Disabled’. These were both published after the death of Pető in the September of that year. In 1968 James House, an American professor who visited the Institute, talked only of ‘conductors’ and ‘the Budapest method’ in an interview, not ‘Conductive Education’ (Maas, 1968). In 1971, James Loring, head of the Spastics Society (UK) reported on a visit with no mention of ‘Conductive Education’. James House went on to initiate a research project at Wisconsin University reported by Laird Heal in 1972 also referred to ‘Conductive Education’. From this time ‘Conductive Education’ seems to have become the term of choice in material held in this library and not other phrases, until the 1980s onwards, when ‘conductive therapy’ and ‘Pető therapy’ started appearing. This is the result of a very limited and fairly quick search of the items in English held in the library. Searching in other languages may produce different results and further investigation would make an interesting research project for someone. Other reports, articles, papers etc not held here may shed further light on the subject, so if you know of, or have any information please let me know! Bobath, B. (1966) Visit to Pető Institute, Budapest, September 1966. Unpublished report. Bobath, K. (1966) Visit to Dr Pető, Budapest, September 1966. Unpublished paper. Cotton, E. (1967) They speak to move. Nursery World, 27 October, pp.5-7. Cotton, E. and Parnwell, M. (1967) From Hungary: the Pető method. Special Education, 56(1), pp.7-11. Heal, L. (1972) Evaluating an integrated approach to the management of cerebral palsy. Final report. Washington: US Office of Education, Department of Health Education and Welfare. Loring, J. (1971) A visit to the Pető Institute for spastic children in Budapest. New Hungarian Quarterly, no. 42, pp.140-143. Maas, R. (1968) Breakthrough in Budapest: an interview with James House. Ideas of Today, 16, pp.110-114. Seglow, D. (1966) Visit to the Pető Institute. Unpublished paper. This is the first item to be highlighted in the way I mentioned yesterday. I would like to stress there is no particular reason for this choice and the same will go for future selections, it will be serendipity. Perhaps I will do a poll after a reasonable number to see what is known, what is considered ‘a good read’ or ‘useful’. We may end up with a top ten! Suggestions for inclusion will be very welcome. Dina was published jointly by the Foundation for Conductive Education and Alabanda Verlag in 1991, the only account of its kind, and since then it has enjoyed modest sales. I have taken the synopsis on the back of the book as the best explanation of its contents. This book is an argument for trusting the personal responsibility and initiative of parents of babies and young children with cerebral palsy. Frau Seiffer, the mother of Dina, who is twenty months old and severely brain damaged, takes her life and the life of her little daughter into her own hands. With the help of Conductive Education she succeeds in discovering her own abilities, submerged and unrecognised by specialists, and uses them to set her child’s personality development in motion and significantly reduce the symptoms of her child’s cerebral palsy. Conductive Education means practising a way of living based upon intense co-operation between the mother (or a person to whom the child relates very closely) and the child, co-operation which gives the child’s motivation a central role. From the correspondence between Frau Seiffer and Frau Gross, who also has a little daughter with cerebral palsy, and the authors, the reader comes to understand not only how the children’s personalities develop but also how their mothers’ insight into the unfamiliar Conductive Educational way of thinking grows. The ‘Booklet for Mothers’ is directed towards mothers of infants and young children with cerebral palsy and intended as a practical manual for living. DINA appeals to parents and specialists alike. It also has something to offer the academic and the researcher. One chapter deals with the theoretical basis of Conductive Education. The book gives insight into the way of thinking of the Pető System and also shows how it can be used in everyday life. With this system success can be achieved in a way which is thought impossible in the world of therapy, determined and fragmented as it is by different specialists. This available to buy from me for £11.95 plus postage and packing – email me for details gill@nice.ac.uk – or via Amazon. Photocopies are not possible. Producing Mária Hári on conductive pedagogy took a lot of hard work but was a labour of love. The library had copies of a number of Mari Hari’s unpublished papers produced 1968-2000 which deserved a wider audience, so eight were selected, edited and published with explanatory introductions to each by Andrew Sutton. Our aim was to end up with a book which ‘explained’ Conductive Education in a easy to understand way in the words of someone who knew what it is all about and according to Susie Mallett, it appears that we were successful. Thanks very much, Susie, feedback is very welcome! It has proved to be a steady seller since publication in 2004, being purchased by conductors, parents, students, academics and health professionals all over the world and hopefully more and more people will want to buy, read and ‘enjoy’. It costs £10.00 plus post and packing of £1.00 in the UK and £2.00 overseas. The other book that Susie mentions, Dina, is also available for £11.95 plus postage and packing as above. Anyone who would like to order either or both books,can do so by contacting me at gill@nice.ac.uk or can order Maria Hari on conductive pedagogy from our bookshop on cafe press.com. Anyone else who would like to share their thoughts and opinions of either book, please let us know and I will report views on this blog. During World War I, the Ottoman Turkish Empire began the mass deportation of Armenians.